This page describes the CAE-based durability analysis that is being implemented in Universal Mechanism software to predict the fatigue damage of parts of mechanical systems. The dynamic simulation of parts is performed using Universal Mechanism. Flexible body representation is considered using external finite element (FE) software. 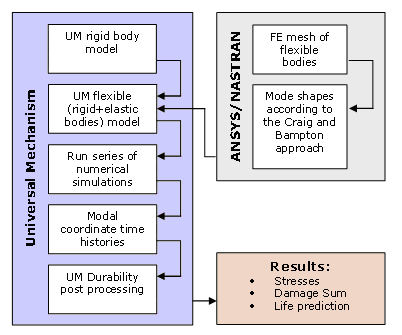 The present version of UM supports the following FE software: ANSYS and MSC NASTRAN. The final durability post-processing analysis is performed using the UM Durability module. The analysis starts with the dynamical hybrid model in Universal Mechanism. The flexibility characteristics of the structural parts are incorporated into UM model using a modal formulation based upon component mode synthesis. Basically, this method represents the part's flexibility using a modal basis, which is optimized to account for constraint and force locations. 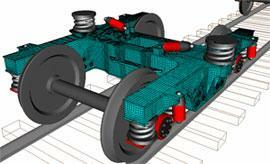 The mode shape displacements and stresses are calculated using the finite element software. The UM Durability module combines the stress time history information generated during series of numerical experiments in UM and the material fatigue strength characteristics to generate the predicted life distribution in the part. Any durability analysis relies on three key inputs. There are 1) Time history of the stresses at any point in the structure and 2) Material data - how the material reacts to repeated stress application at various stress levels. By employing the full finite element representation of the component in the UM model, the local stresses are directly obtained as result of the UM solution. In the UM FEM module, flexible body deformations are modeled as a linear combination of mode shapes. As long as the number of mode shapes selected adequately the modal superposition will model deformations accurately and efficiently. When UM Durability is started, the user is prompted for the location of modal coordinate time history files and orthonormalized mode shapes files, then the type of analysis required and the material data to be used. With all of the parameters set, UM Durability performs the stress at every node, and then proceeds to multi channel peak/valley extraction and rain flow cycle counting, followed by the damage sum. The idea that the deformation of a flexible body can be represented by the sum of a number of mode shapes, scaled by appropriate factors, can be extended to stresses in the body as well. These factors, or modal coordinates, can be used as the scaling factors on the stress solution of each mode shape and the superposition of these scaled stresses represents the body's instantaneous stress state. If the superposition is performed at every node in the finite element model, for every time step in the UM solution, the stress time history is defined at every location. 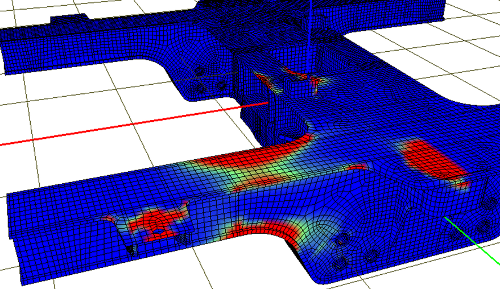 Using the UM FEM tools the modal coordinate time history can be saved for every numerical simulation in UM. Based on this modal time history and file with orthonormalized mode shapes from ANSYS or MSC NASTRAN the stresses at every node can be obtained.